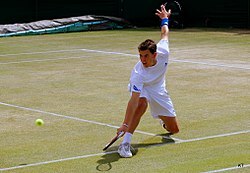 Dominic Thiem (German pronunciation: [ˈdɔmɪnɪk ˈtiːm]; born 3 September 1993) is an Austrian professional tennis player who has a career-high ATP ranking of world No. 4, which he first achieved on 6 November 2017. He has won twelve singles titles on the ATP Tour. In 2018, Thiem reached his first Grand Slam final at the French Open. In 2019, he won his first ATP Masters 1000 title at Indian Wells. 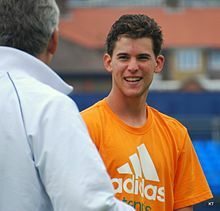 Thiem has been coached by Günter Bresnik since age nine, but he has known Bresnik since he was three — after Thiem’s father, Wolfgang, came to work as a coach at Bresnik’s academy in Vienna in 1997. Thiem reached an ITF Junior world ranking of No. 2 (combined singles and doubles). He lost a close final match at the 2011 French Open Boys' event, to Bjorn Fratangelo, in three sets. Thiem completed his junior career by winning his last three singles tournaments, culminating in taking the singles title of the prestigious Dunlop Orange Bowl. Thiem received wild cards to the main draw of Kitzbühel, Bangkok and Vienna. In Vienna, Thiem recorded his first ATP win, over Thomas Muster, before losing to Steve Darcis in the second round. In 2013, Thiem received a wild card to the main draw in the 2013 Bet-at-home Cup Kitzbühel, where he made it through to the quarterfinals by defeating the fourth seed Jürgen Melzer in the second round. He lost in the quarterfinals to Albert Montañés in straight sets. Thiem reached his second quarterfinal of the year of an ATP 250 event at the 2013 Erste Bank Open. He was given a wildcard, but lost to the top seed, Jo-Wilfried Tsonga, in three tough sets. Thiem started off the year at the 2014 Qatar ExxonMobil Open by making it through the three rounds of qualifying to get a place in the main draw, but lost to Peter Gojowczyk in the first round. At the 2014 Australian Open, Thiem made it through the three rounds of qualifying and defeating the second seed along the way, Martin Kližan, to get a spot in the main draw. He defeated João Sousa in the first round in four sets, making it his first main-draw victory at a Grand Slam tournament. He then lost to 19th seed Kevin Anderson in straight sets. Thiem qualified for the 2014 ABN AMRO World Tennis Tournament, beating Kenny de Schepper and Adrian Sikora to be in the main draw of an ATP 500 event for the first time in his career. In the first round of the main draw, Thiem beat Jarkko Nieminen in three sets to progress to the second round. In the second round, he lost to Andy Murray in three sets, having won the second. At the 2014 BNP Paribas Open Thiem was seeded sixth in qualifying and made it into the main draw. He defeated American qualifier Daniel Kosakowski in the first round in his first Masters 1000. He then had his most remarkable win to date in the second round against the 21st seed and former World No. 6, Gilles Simon, in straight sets. He then lost to Julien Benneteau in two sets. The next week at the 2014 Sony Open Tennis he made it through the qualifying rounds again to get a spot in the main draw. He defeated Lukáš Rosol in straight sets in the first round. He was defeated by the sixteenth seed, Tommy Robredo, in the second round in a tight two setter. Thiem received a wild card entry into the main draw of the Monte Carlo Rolex Masters. But he got defeated in the first round by Frenchman Nicolas Mahut in three sets. The next week he made it through the two rounds of qualifying at the 2014 Barcelona Open Banc Sabadell. In the first round he beat veteran player, Radek Štěpánek, in straight sets. In the 2nd round, Thiem beat Marcel Granollers, before losing to Santiago Giraldo. At the 2014 Mutua Madrid Open, Thiem qualified for a main tour event for the 7th time in 2014. In the first round of the main draw, he beat Dmitry Tursunov to progress to the 2nd round where he had the biggest win of his career when he defeated the world number 3 Stanislas Wawrinka in three sets. Thiem started his campaign at the 2014 French Open by beating Frenchman Paul-Henri Mathieu in straight sets. In the second round he faced world number 1 and the defending champion Rafael Nadal, but was defeated in straight sets, only winning 7 games in the process. Thiem next played at the 2014 Aegon Championships in London but lost in the first round to David Goffin. He suffered a second consecutive first-round loss on grass when he was defeated by Australian qualifier Luke Saville at the 2014 Wimbledon Championships in four sets. After Wimbledon, Thiem played at the 2014 International German Open. He defeated Jiří Veselý in straight sets and No. 8 seed Marcel Granollers in three sets before being defeated by Leonardo Mayer in the third round. Thiem was seeded at an ATP tournament for the first time in his career at the 2014 Crédit Agricole Suisse Open Gstaad. Seeded 8th, he lost in the first round to wildcard Viktor Troicki. At the 2014 Bet-at-home Cup Kitzbühel, Thiem was seeded fifth. In the quarterfinals he defeated defending champion and number two seed Marcel Granollers in straight sets. He then beat Juan Mónaco to reach his first ATP World Tour 250 final at the age of 20. In the final, he fell to David Goffin despite being a set up. Competing in his first ever US Open in 2014, Thiem reached the fourth round after two first round defeats in both Toronto and Cincinnati Masters. He defeated Slovakian Lukáš Lacko, 11th seed Ernests Gulbis, and 19th seed Feliciano López, before losing to 6th seed Tomáš Berdych. At the 2015 Australian Open, Thiem lost in the first round to Roberto Bautista Agut. At Rotterdam he beat Ernests Gulbis in the first round but fell to Sergiy Stakhovsky in the second round. At Marseille, he defeated João Sousa and David Goffin to reach the quarter-finals, where he was beaten by Bautista Agut. The next week in Dubai, he lost again to the Spaniard in the first round. The Austrian reached the quarter-finals at the Miami Open, after defeating Diego Schwartzman, Feliciano López, Jack Sock and Adrian Mannarino, then lost to Andy Murray in three sets. At the Rome Masters he won over Gilles Simon to reach the third round, where he was defeated by Stanislas Wawrinka. 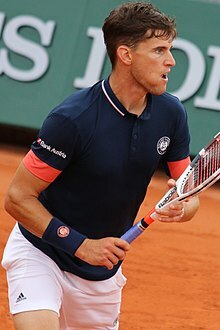 Thiem won his first career ATP World Tour title in Nice, France, defeating Nick Kyrgios, Ernests Gulbis and John Isner en route to winning a close three-setter against Argentina's Leonardo Mayer in the final. At the 2015 French Open, Thiem defeated Aljaž Bedene in four sets to progress to the second round, where he was defeated by 21st seed Pablo Cuevas in four close sets. Thiem started his grass court campaign at the 2015 MercedesCup, where he entered as the seventh seed. Despite this, he fell in the first round to qualifier Mischa Zverev. At the 2015 Gerry Weber Open, Thiem suffered another first round loss, against second seed Kei Nishikori. The Austrian entered the 2015 Aegon Open Nottingham as the seventh seed, which gained him a bye into the second round. He easily defeated Malek Jaziri to claim his first win on grass in 2015, but was knocked out in the next round by Alexandr Dolgopolov. Thiem competed at the third grand slam of the year, the 2015 Wimbledon Championships as the 32nd seed, marking the first time he had been seeded at a grand slam tournament. He defeated Israel's Dudi Sela in four sets, marking his first ever win at Wimbledon. In the second round, Thiem lost a close five-setter against Fernando Verdasco, despite being 2–1 up in sets. After Wimbledon, he next participated at the 2015 Croatia Open Umag as the fourth seed, giving him a bye into the second round. With wins over Dušan Lajović and compatriot Andreas Haider-Maurer (after both players retired), Thiem advanced to the semifinals, where he came back from a set down to win against Gaël Monfils and earn himself a place in his third career final. In the final, he defeated Portugal's João Sousa in straight sets to claim his second career ATP World Tour title. A week later, Thiem won his third title at the 2015 Swiss Open Gstaad, beating David Goffin in the final, and winning back to back tournaments for the first time. As a result of these tournament wins, Thiem achieved a new career high ATP ranking of world No. 21. Thiem next played at his home tournament, the 2015 Generali Open Kitzbühel as the No. 1 seed, marking the first time he entered an ATP tournament as the top seeded player. After receiving a bye, he managed to avoid an early exit, as he gained a close three set win against Andreas Haider-Maurer, despite being a set down, and a break down in the final set. He defeated Albert Montañés in the quarterfinals, after his opponent retired five games into the second set. In the semifinals, he was denied a place in his third consecutive final when he lost to German Philipp Kohlschreiber in two sets, ending his winning streak of 10 matches. After the tournament ended, Thiem entered the top 20 for the first time, reaching a new career high of world No. 18. Thiem started the year with a semifinal run in Brisbane on outdoor hard courts, beating James Duckworth, Denis Kudla and world no. 13 Marin Čilić, but losing to Roger Federer in straight sets. He then received a bye into the second round of the Sydney International, where he retired against Gilles Müller due to a recurring right foot blister. Thiem reached the third round of the Australian Open, his best run yet. He beat Leonardo Mayer and Nicolás Almagro, but lost to world number 16 David Goffin in four sets. Thiem next competed at the Argentina Open, where he was seeded fifth. He beat Pablo Carreño, Gastão Elias (saving a match point), and Dušan Lajović to reach the semifinals. There, he upset top seed, world number 5 and defending champion Rafael Nadal in three sets after saving another match point. Thiem went on to win his fourth ATP title by defeating Nicolás Almagro in three sets. He next competed at the Rio Open. There, Thiem defeated Pablo Andújar and Diego Schwartzman to reach the quarterfinals. He ensured that he would contest his second semifinal in as many weeks with a second top-ten win in two weeks, this time over David Ferrer. After the match, Thiem stated that "it was one of the "best matches of [his] life". However, he faced a surprise defeat against No. 71 Guido Pella in the semifinals, displaying visible signs of fatigue during the match. Despite this, due to his deep runs in two consecutive tournaments, he attained a career-high ranking of 15 on 22 February 2016, and was named the ATP's "Mover of the Week". In February, Thiem won the Mexican Open in Acapulco: his first hard court title, the four others having come on clay. He defeated Damir Džumhur, Dmitry Tursunov, Grigor Dimitrov, Sam Querrey and Bernard Tomic en route. This was his first ATP 500 title and second crown in the space of three weeks. With this win, Thiem once again attained a career-high ranking, this time of 14 on 29 February. He also rose to No. 3 in the Race to London. 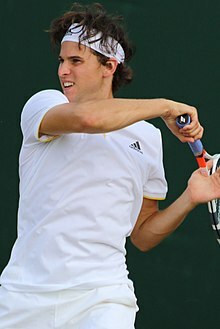 In early March, Thiem participated in Austria's Davis Cup Group I first round tie versus Portugal on indoor hard courts. In singles, he defeated familiar foe Gastão Elias in a fifth set tiebreak. Partnering compatriot Alexander Peya, he also beat Elias and João Sousa in doubles in five sets. In reverse singles, Thiem took down Sousa in straight sets to give Austria an unassailable 3–1 lead, and the team went on to win the tie by four rubbers to one. Following the tie, he reached another milestone ranking, becoming the world number 13 on 7 March. Next, Thiem competed at Indian Wells on outdoor hard courts. He defeated Jozef Kovalík, at which point he "notched a tour-leading 21st match win of the year", and Jack Sock, before falling to world number 9 Jo-Wilfried Tsonga. In late March, Thiem traveled to Miami, an outdoor hard court tournament. He defeated Sam Groth and Yoshihito Nishioka, before succumbing to world No. 1 and two-time defending champion Novak Djokovic in straight sets. Thiem held fifteen break points over the course of the match, but was only able to make good on one. In early April, Thiem played at the Monte-Carlo Masters. He beat Jan-Lennard Struff and Taro Daniel in three sets apiece, before losing to a resurgent Rafael Nadal in straights. In early May, Thiem lost to resurgent Argentine Juan Martín del Potro in the first round of the ATP Madrid Masters. He then competed in the Italian Open, winning his first round match against Alexandr Dolgopolov after losing the second set. In his second round match he played Joao Sousa, defeating him in straight sets. He next played Roger Federer, who was suffering from a back injury. He earned his fourth top 10 win by defeating him in straight sets. In the quarterfinals, Thiem lost to sixth seed Kei Nishikori in straight sets. In Nice, Thiem successfully defended his title, beating Alexander Zverev, having not lost a set until the final. At the French Open, Thiem reached the semi-finals of a major for the first time by defeating Íñigo Cervantes, Guillermo García-López, Alexander Zverev and Marcel Granollers before defeating David Goffin in the quarter-finals. He lost to No. 1 and eventual champion Novak Djokovic in the semis. By reaching this semifinal he also made his debut inside the Top 10 of ATP Rankings as world No. 7. In early June, Thiem competed at the 2016 MercedesCup as the 3rd seed, defeating Sam Groth in the second round. He reached the semifinal of a grass tournament for the first time after coming from a set down against Mikhail Youzhny. Then he defeated 1st seed Roger Federer for the second time in a row surviving two match points. In the final, he defeated Philipp Kohlschreiber in three sets over the course of two days to win his first ever grass court tournament. With the win he became only the ninth active player – and 29th in Open Era history (since May 1968) – to win three titles on three different surfaces in the same year. After the Mercedes Cup Thiem competed at the Gerry Weber Open where he defeated in straight sets Joua Sousa and Teymuraz Gabashvili before meeting upon Philipp Kohlschreiber whom he surpassed via WO. In the semifinal he lost to Florian Meyer, who eventually defeated Alexander Zverev in the final. 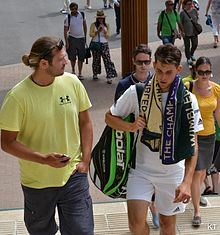 At Wimbledon, Thiem encountered again Florian Meyer in the first round, but this time Thiem won in straight sets, in the second round he was defeated by Jiri Vesely. Thiem then played at the Austrian Open Kitzbühel where he was defeated by Jürgen Melzer in the second round. At the Rogers Cup in Toronto he met Kevin Anderson and had to retire after 5 games. At the U.S. Open, Thiem battled past John Millman in five sets in the first round, and then had an easy victory against Ricardas Berankis in straight sets. Thiem then beat Pablo Carreño Busta to reach the fourth round, where he retired against Juan Martín del Potro because his right knee was bothering him. After the US Open, Thiem reached the final in Metz but lost in a close match against Lucas Pouille, which was Pouille's maiden ATP title. In the Asian swing, he was upset by Alexander Zverev in the first round of the China Open in 3 sets. He next played at the BNP Paribas Masters in Paris and was beaten heavily by resurgent American, Jack Sock. This defeat took Thiem's opportunity to qualify for the ATP Finals out of his hands and extended his title drought. His last title was at the beginning of June. However, Thiem still qualified for the Finals. He scored a win against Gael Monfils, but was still eliminated in the round robin. He ended the year ranked no. 8, just one place shy of his career-high ranking. Thiem began the year by playing at the Brisbane International, both in singles and doubles. He played with Kei Nishikori in doubles. He beat Sam Groth, but lost in the quarter-finals against eventual winner Grigor Dimitrov. Thiem then proceeded to play at the Apia International Sydney, as the No. 1 seed. Thiem overcame Gastao Elias but lost in the quarter-finals to tournament finalist Dan Evans. At the Australian Open, Thiem defeated Jan-Lennard Struff, Jordan Thompson, and Benoit Paire in the early rounds, but as in 2016 he lost to Goffin, this time in the fourth round. Thiem's backhand was a weakness against Goffin, with 29 backhand unforced errors, according to IBM Slamtracker Rally Stats. After defeat in his first match at the Sofia Open, where he was the top seed, to Nikoloz Basilashvili, Thiem headed to Rotterdam for the first ATP 500 event of the year, where he was the second seed. After defeating Alexander Zverev and Gilles Simon, Thiem was surprisingly defeated in the quarterfinals by Pierre-Hugues Herbert. The following week, Thiem was again the second seed at an ATP 500 event, this time at the Rio Open. Thiem reached his first final of the year, with wins over Janko Tipsarević, Dušan Lajović, Diego Schwartzman, and Albert Ramos Viñolas. Thiem would take his first title since June, defeating Pablo Carreño Busta in the final. This was Thiem's eighth ATP World Tour title, his sixth on clay, and his second at the 500 level. After victory in Rio, Thiem played in his third consecutive ATP 500 event in as many weeks at the Mexican Open in Acapulco, where he was the defending champion. Seeded fourth, Thiem defeated France's Gilles Simon and Adrian Mannarino, beating both in straight sets, to reach the quarterfinals. Thiem's defence was ended by Sam Querrey, who eventually won the tournament. Thiem then headed to the BNP Paribas Open for the first Masters 1000 event of the year. Seeded eighth, Thiem comfortably worked his way through his first three matches, defeating Jeremy Chardy, Mischa Zverev and Gael Monfils without dropping a set. In the quarter-finals, he met Stan Wawrinka, but Thiem would miss out on a first Masters 1000 semi-final, losing a final set tie-breaker. After losing his opening round match in Miami to Borna Coric, and second round exit in Monte Carlo to David Goffin, he made his 12th ATP tour final, and second of the year, in Barcelona losing to Rafael Nadal in two sets. En route he scored his first win over a current world No. 1, beating Andy Murray in the semis in three sets. In May 2017 at the Mutua Madrid Open, Thiem defeated Jared Donaldson, Grigor Dimitrov (in a very tight 3rd-set tiebreaker), Borna Coric, and Pablo Cuevas to play against Rafael Nadal in his first Masters 1000 final. This was Thiem's second tournament in a row in a final against Nadal. Thiem lost to Nadal but showed an improvement over his Barcelona Open scores against Nadal. As a result of this performance, Thiem ended the week ranked No. 3 in the Singles Race (to London). Thiem defeated Rafael Nadal in the quarterfinals of the Rome Masters 1000 tournament in two straight sets, before falling to Novak Djokovic in the Semifinals. At the French Open, Thiem did not drop a set in getting past Bernard Tomic, Simone Bolelli, Steve Johnson, Horacio Zeballos and defending champion Novak Djokovic, before losing to eventual champion Rafael Nadal in straight sets. His win over Djokovic meant that he has now beaten each of the Big Four (Djokovic, Nadal, Federer and Murray) at least once. At the beginning of the grass court season, Thiem reached the second round of the Halle Open, losing to Robin Haase. Then, in the second round of the Antalya Open, he was stunned by qualifier Ramkumar Ramanathan, then ranked 222 in the world. He made a comeback in Wimbledon, reaching the fourth round for the first time in his career. He was ousted by eventual semi-finalist Tomas Berdych. Thiem then participated in the Washington Open, where he lost narrowly to Kevin Anderson in the third round. At Montreal, he received a bye into the second round, but lost to Diego Schwartzman. He then reached the quarter-finals of Cincinnati, where he lost to David Ferrer in straight sets. At the US Open, Thiem made it to the fourth round. He began his fourth round match against Juan Martín del Potro cruising against his opponent, taking a 6–1, 6–2 lead. However, from there del Potro's form greatly increased and Thiem eventually lost in five sets, after failing to capitalise on two match points in the fourth set. Thiem qualified for the ATP Finals for the second year running. However, also for the second consecutive year, Thiem struggled with form following the US Open. After losing three straight matches in Chengdu, Tokyo and Shanghai against Guido Pella, Steve Johnson and Viktor Troicki respectively, he lost his second match in both Vienna and Paris to Richard Gasquet and Fernando Verdasco respectively. Despite this poor run of form, prior to the ATP Finals Thiem broke into the top five in the rankings for the first time in his career, rising to World No.4. During the round robin stage ATP Finals, Thiem defeated Pablo Carreño Busta in three sets, but lost to David Goffin and Grigor Dimitrov in two and three sets respectively. He did not advance to the semi-finals. In late December 2017, Coach Galo Blanco was added to Thiem's team. Thiem began his season at the Qatar ExxonMobil Open as the top seed. He reached the semifinals where he withdrew from his match against Gaël Monfils due to illness. In January, he lost against Novak Djokovic at the Kooyong Classic, an exhibition tournament. At the Australian Open, Dominic beat Guido Pella and Denis Kudla from two sets down. He won his third-round match over Adrian Mannarino, but lost in the fourth against Tennys Sandgren. This was equal to his result of the previous year at the Australian Open. Thiem's next tournament in mid-February 2018 saw him win his ninth ATP Tour title at the Argentina Open, his second in Buenos Aires, defeating Horacio Zeballos, Pella, Monfils, and Aljaž Bedene. This was his first title in nearly a year. In Indian Wells, he won his second round match against Stefanos Tsitsipas. In his third-round match against Pablo Cuevas, he rolled his ankle at the end of the first set that he won 6–3. He then lost the second 4–6 and retired at the score of 2–4 in the third. He skipped Miami because of the hairline-fracture-ankle injury. Going into the clay season, Thiem played his first tournament in Monte Carlo, defeating Andrey Rublev and Novak Djokovic, before losing to Rafael Nadal in the quarterfinals. In Barcelona, he again advanced to the quarterfinals, before falling in straight sets to Stefanos Tsitsipas, who then lost to Nadal in the final. Thiem's next tournament was in Madrid, where he would again face Nadal in the quarterfinals. This time, he came through to win, ending Nadal's 21-match and record 50-set winning streak on clay. Thiem had been the last man to take a set and win against Nadal on clay the previous year in Rome. Thiem then defeated Kevin Anderson in straight sets to reach his second consecutive final in the Spanish capital, where he lost to Alexander Zverev in straight sets. Thiem was the sixth seed at Rome, but lost his first match to Fabio Fognini in three sets. Thiem then played in Lyon, where he made it to the final beating Roberto Carballés Baena in straight sets, before coming a set down against Guillermo García López with the match lasting over two days. He then defeated Dušan Lajović in three sets in the same day before coming back from a set and a break down against Gilles Simon in the final to win his 10th ATP title. At the French Open, Thiem advanced past Ilya Ivashka in straight sets and Stefanos Tsitsipas and Matteo Berrettini in four sets. He faced Kei Nishikori in the fourth round, winning the first two sets 6–2, 6–0, before a late resurgence saw Nishikori take the third set. However, Thiem was able to take the fourth set 6–4 to win the match. In the quarterfinals, he faced second seed Alexander Zverev in Zverev's first major quarterfinal, defeating him 6–4, 6–2, 6–1. In his third consecutive French Open semi-final, Thiem defeated unseeded Marco Cecchinato in straight sets to advance to his first Grand Slam final. He then lost in straight sets in the final to Rafael Nadal, who won his 11th French Open crown. At Halle, Thiem was upset in the second round by Yūichi Sugita. His poor grass court season continued with a first round retirement against Marcos Baghdatis at Wimbledon. Thiem played in Hamburg, losing in the quarterfinals to Nicolás Jarry in a tight two setter. He was then upset at his home tournament in Kitzbühel, Austria, losing to eventual champion Martin Kližan in his first match. Thiem lost to Stefanos Tsitsipas in his first match at the Rogers Cup, and was forced to withdraw from Cincinnati due to illness. His run of misfortune ended at the US Open, where he defeated Mirza Bašić, Stevie Johnson, and Taylor Fritz to reach the fourth round for the third consecutive year. There, he faced 2017 finalist and fifth seed Kevin Anderson, defeating him in straight sets to reach his first Grand Slam quarterfinal on hard court, where he faced defending champion and top seed Rafael Nadal. This was their first ever meeting on a surface other than clay. In a shocking start to the match, Thiem won the first set 6-0, yielding only 7 points to Nadal. This was the first set Thiem had ever won against Nadal at a Grand Slam. Nadal took control and won the second and third sets, despite Thiem serving for the set at 5-4 in the third. In the fourth set, Thiem was again up a break early, but lost his lead and won the set 7-4 in a tiebreaker. In the fifth set, after finding himself at 0-40 on serve at 5-5, Thiem won five consecutive points to prevent Nadal from serving for the match. Nadal narrowly won the fifth set tiebreaker 7-5 to bring the match to an end at 2:04 AM local time, after 4 hours and 49 minutes of play. Later that month, Thiem followed up his US Open run with a title win at the St Petersburg Open. He defeated Jan-Lennard Struff, 8th seed Daniil Medvedev, 5th seed Roberto Bautista Agut, and unseeded Martin Kližan to secure his ninth ATP 250 title. At the Shanghai Masters, Thiem was upset by unseeded Matthew Ebden in his first match. Thiem was the top seed at the 2018 Erste Bank Open, advancing to the quarterfinals where he lost to Kei Nishikori. At the Paris Masters, Thiem was seeded sixth. He defeated Gilles Simon, 11th seed Borna Ćorić, and 16th seed and defending champion Jack Sock, before losing to eventual champion Karen Khachanov in the semifinals. At the 2018 ATP Finals, Thiem was eliminated in the group stage after winning one match, against Kei Nishikori, and losing his two others, against Kevin Anderson and Roger Federer. He ended the 2018 season ranked world number 8. Thiem was seeded second at the Qatar Open, but was upset in the first round by Pierre-Hugues Herbert. At the Australian Open, he defeated Benoît Paire in five sets before losing to Alexei Popyrin in the second round. He failed to defend his title in Buenos Aires and was knocked out of the 2019 Rio Open by Laslo Đere in the round of 32. At the Indian Wells Masters, he defeated Ivo Karlovic, got a walkover through Gael Monfils, and beat Milos Raonic en route to the final, where he defeated Roger Federer in three sets to claim his first ATP Masters 1000 title. As a result, he returned to his career-best ranking of World No. 4. Coach Nicolas Massu was a new addition to Thiem's team about a month before the Indian Wells tournament. Thiem is primarily an aggressive baseline player, who is adept at defending, as well. His groundstrokes are solid on both wings, with a heavy forehand and a tenacious, powerful single-handed backhand. He is notably one of the few younger ATP players to use a single-handed backhand. According to Thiem, he changed to his now-famous single-handed backhand at the advice of his coach. His backhand can effectively handle high bouncing balls which has been a big problem for a lot of single-handers, including Roger Federer. Thiem often uses heavy, penetrating groundstrokes to construct points and hit winners or outlast his opponents. He has a long take-back on both wings, and the top-spin he produces on his groundstrokes allows him to both attack and defend well. Thiem also possesses a strong serve, capable of reaching 145 mph (233 km/h). His kick serve is regarded as one of, if not the best, in the men’s game today, with regards to rate of topspin and construction of winners. Thiem has solid volleys, though they are not a major weapon in his game. He often only comes up to the net to finish off points with a single volley, though he has been known to occasionally serve-and-volley, as well, especially when playing on clay and serving from the ad side to his opponent's backhand. Thiem often employs a top-spin serve for both his first and second serves, resulting in a relatively slow, but looping, serve that forces his opponents back. Compared to the younger players on the ATP tour, Thiem uses prolonged baseline play and careful construction of points to win. His deliberate, yet aggressive playing style, particularly the long take-back on his groundstrokes, ability to sustain long baseline rallies and top-spin serves have greatly benefited his clay game, where he has had the most success (winning eight of his twelve ATP titles on that surface). He has beaten many great clay-court players on clay, most notably Nicolás Almagro and Rafael Nadal en route to his Argentina Open title, as well as Stan Wawrinka in 2014 in the Madrid Open and Federer in Rome. His mental game has also been praised, especially his tie-break win percentage. Thiem began dating fellow tennis player Kristina Mladenovic in mid 2017. They publicly confirmed their relationship in May 2018. ^ "Dominic Thiem – Overview – ATP World Tour – Tennis". ^ "The pronunciation by Dominic Thiem himself". ATP World Tour. Retrieved 22 October 2017. ^ "First-Time Winner Spotlight: Dominic Thiem". ATP World Tour. ATP Tour, Inc. Retrieved 15 May 2018. ^ Hughes, Dan (13 January 2016). "Müller back in quarterfinals". Sydney International. ^ a b "Thiem Hangs On For Buenos Aires Title". www.atpworldtour.com. Association of Tennis Professionals (ATP). 14 February 2016. ^ "Cuevas, Pella into Rio Open final; Nadal and Thiem beaten". ^ a b "Rankings – Singles – ATP World Tour – Tennis". ^ "Thiem Defeats Tomic For Acapulco 2016 Title – ATP World Tour – Tennis". ^ "Emirates ATP Race to London". Association of Tennis Professionals. 29 February 2016. ^ "Tickets On Sale For 2016 Barclays ATP World Tour Finals". ATP World Tour Finals. 15 March 2016. ^ "Thiem, Tsonga Battle Into Third Round". Association of Tennis Professionals. 13 March 2016. ^ "Djokovic Holds Off Thiem In Miami". ATP World Tour. 29 March 2016. ^ "Kohlschreiber Tops Thiem To Win His Third Munich Title". ATP World Tour. 1 May 2016. Archived from the original on 2 May 2016. ^ "Roland Garros Goffin Thiem Quarterfinal Thursday – ATP World Tour – Tennis". ^ "Thiem Wins Fourth Title Of Year In Stuttgart – ATP World Tour – Tennis". ^ "Halle – Results – ATP World Tour – Tennis". ^ "Vesely Upsets Thiem At Wimbledon – ATP World Tour – Tennis". ^ "Kitzbuhel Melzer Thiem Kohlschreiber Wednesday 2016 – ATP World Tour – Tennis". ^ Borkowski, Pete. "Dominic Thiem discusses injury after Rogers Cup retirement". ^ "Dominic Thiem suffers surprise defeat to Robin Haase at Gerry Weber Open in Germany". Sky Sports. Retrieved 27 June 2017. ^ "Ramanathan Stuns Thiem In Antalya | ATP World Tour | Tennis". ATP World Tour. Retrieved 27 June 2017. ^ "Qatar Tennis Federation | QTF | Qatar Tennis Tournaments and Championships". Retrieved 5 January 2018. ^ "Thiem FedEx ATP Player Profile 2016 – ATP World Tour – Tennis". ^ "Dominic Thiem, Jo-Wilfried Tsonga Reach Third Round In Indian Wells – ATP World Tour – Tennis". ^ "Mladenovic and Thiem, now officially a couple, hoping to gain momentum". Tennis.com. Retrieved 19 September 2018. Wikimedia Commons has media related to Dominic Thiem. This page was last edited on 8 April 2019, at 02:44 (UTC).